OnePlus was revealed the latest flagship OnePlus 5T at an event in New York last week. The phone launched with 6-inch optic AMOLED screen with extremely narrow bezels. OnePlus 5T running OxygenOS 4.7.1 based on Android 7.1.1 Nougat. The company already released the Android Oreo update for OnePlus 3/3T and soon Oreo update for OnePlus 5/5T will be released soon. The OxygenOS 4.7.1 update is the first ever build for OnePlus 5T which is now available for download. 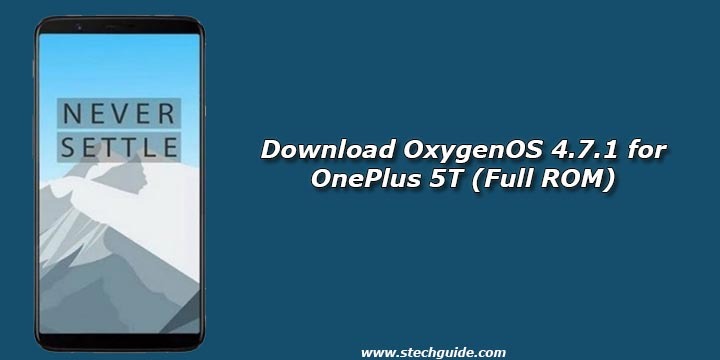 Download OxygenOS 4.7.1 for OnePlus 5T from below. The OxygenOS 4.7.1 for OnePlus 5 is not available via OTA as it is the very first build for the device. This is useful for those who already start tweaking the device. If during the rooting process or while applying any other tweak, if anything goes wrong then you can install the OxygenOS 4.7.1 manually to restore your phone. Download OxygenOS 4.7.1 for OnePlus 5T from below. The Oxygen OS 4.7.1 for OnePlus 5 can easily be flashed via stock or TWRP recovery. So if you want to update OxygeOS 4.7.1 Full Firmware package for your OnePlus 5T then Download OxygenOS 4.7.1 for OnePlus 5T from below. 1) Download OxygenOS 4.7.1 Full Firmware zip file from above and save it on your internal phone memory. 4) Now your device will reboot into stock recovery and flash the OTA. 1) First Unlock your device bootloader and Install TWRP on your Device. Skip this step if already installed TWRP. 2) Reboot your device into Recovery mode and create a Nandroid backup (Recommended) of your device for safer side, if anything goes wrong. 3) Now wipe your cache files by Goto Wipe>Advanced Wipe>Select Wipe cache and Dalvik cache and swipe to confirm it. 5) Now Flash the Magisk Or SuperSU again to maintain the root (Optional). 6) Wipe Dalvik & Cache again. 7) Done! Reboot System and Enjoy.